Instant Pot Creamy Chicken Enchiladas are made with shredded salsa verde chicken, cheese and cream cheese. 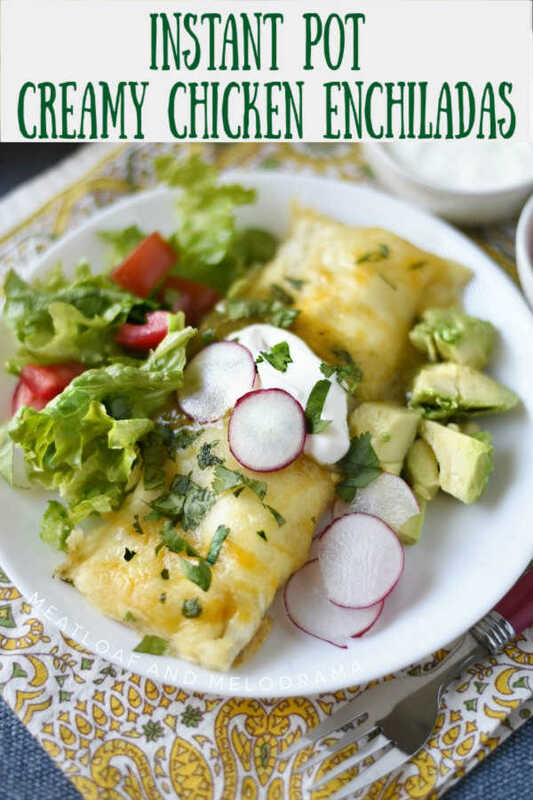 An easy chicken enchilada recipe everyone loves! This easy chicken enchilada recipe starts out with one of our favorite Instant Pot recipes — salsa verde chicken. I use the shredded chicken for tacos, burrito bowls, salads and — enchiladas! 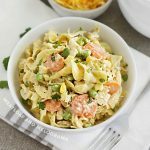 I used to make enchiladas with rotisserie chicken or baked chicken, but making the shredded chicken in the Instant Pot is easier and tastier. 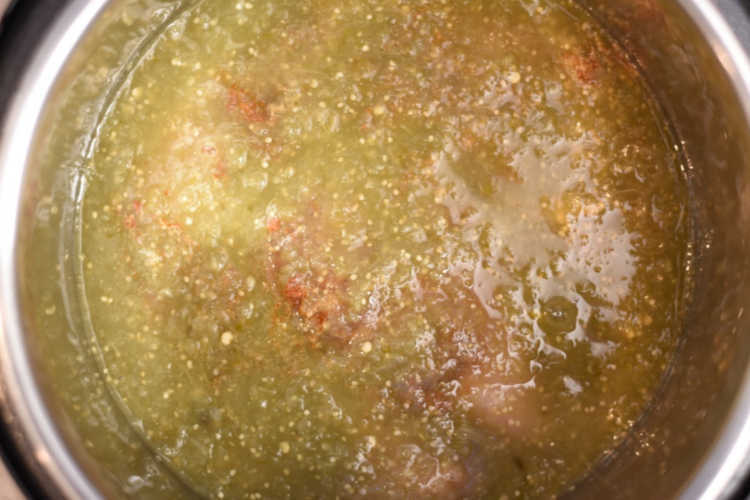 The chicken gets infused with wonderful flavors from spices and salsa verde. And as a bonus, it doesn’t dry out! 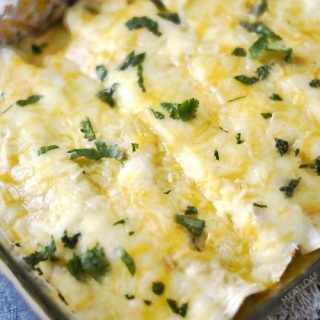 These creamy chicken enchiladas with cream cheese are similar to white chicken enchiladas, except they’re not cooked in a cream sauce. So, they’re a little lighter and tangier but not as spicy as traditional enchiladas in red sauce. My family actually prefers these salsa verde chicken enchiladas. 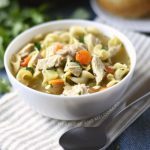 In fact, it’s now one of our favorite Instant Pot dinner recipes! 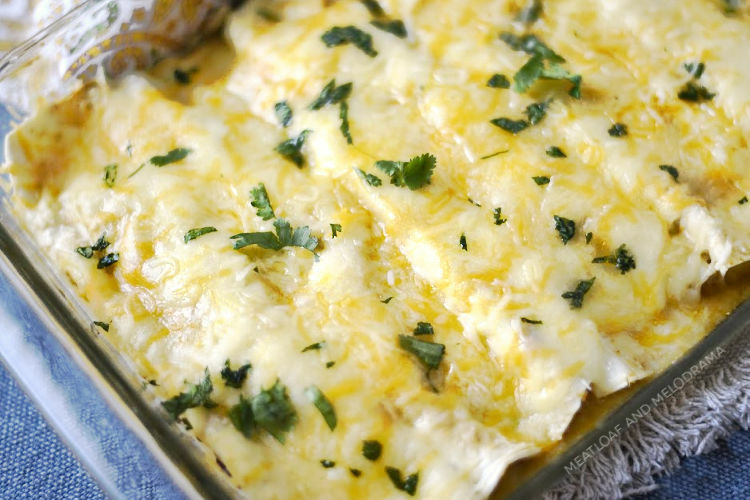 How do you make easy chicken enchiladas? This chicken enchilada recipe makes enough for 12 enchiladas, which might be a lot for some of you. 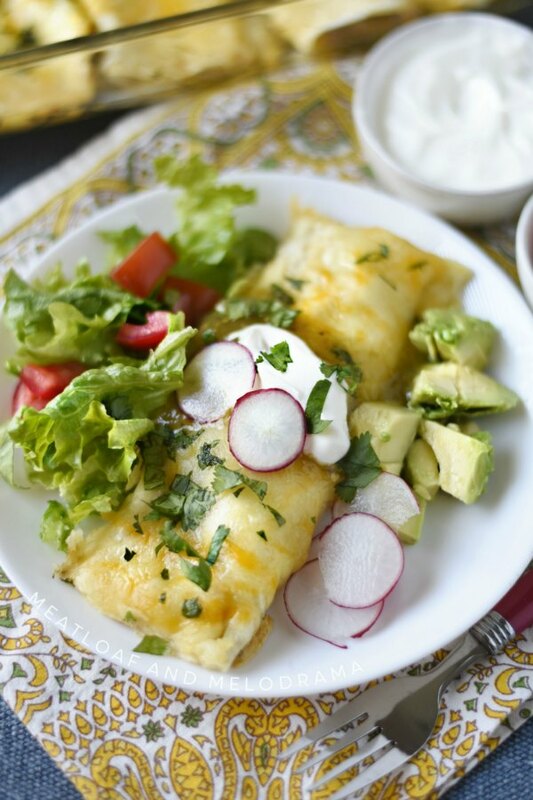 But, leftover enchiladas are awesome – I may or may not had one for breakfast! You can also use the extra chicken for something else, or you can make 6 completely stuffed enchiladas! First, you cook the chicken with salsa verde in your Instant Pot. Next, you remove the chicken and shred it — Keep the pieces on the big side, though. And, then you mix in some cream cheese. 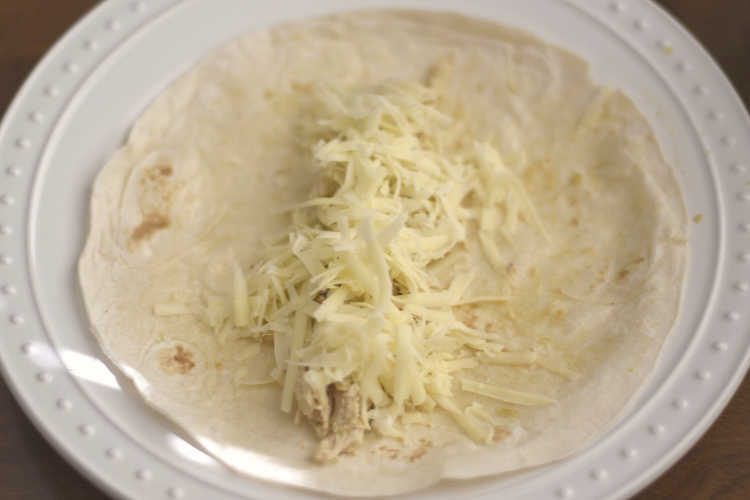 Then, you spread some of the cooking liquid on a tortilla, place some chicken in the middle, and top it with Monterey Jack cheese. Roll the tortilla up, place it seam-side-down in a baking dish with some of the cooking liquid on the bottom, and repeat the process. If you’re making 12 enchiladas at once, you’ll have to divide the cooking liquid between two baking pans. Pour the remaining cooking liquid over the enchiladas, top with more shredded cheese, and bake! I like to add some cheddar or Mexican blend shredded cheese over the top before the enchiladas are done baking. It’s optional, but it gives the dish a little more color, and you can’t go wrong with more cheese! Actually, you can use as much cheese as you want in this recipe — no judging, here! Let the enchiladas rest for about 5 minutes before serving. Then, use your favorite toppings to liven things up! Serve them with sour cream, salsa verde, diced tomatoes, avocados, radishes — no rules here! 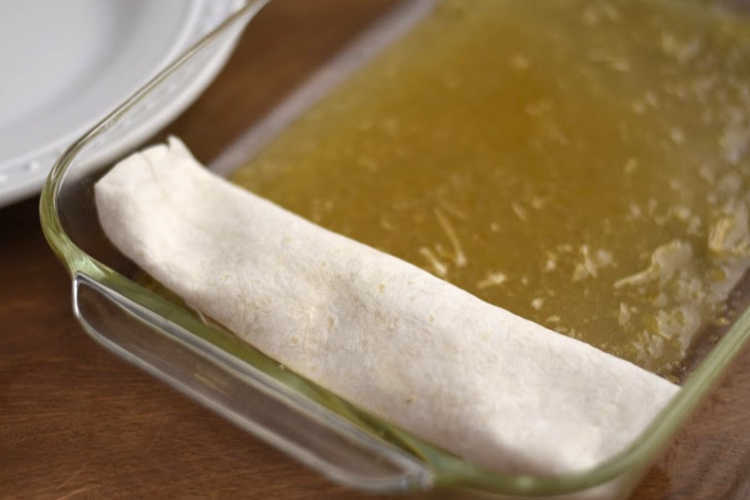 Do you use flour or corn tortillas for enchiladas? Corn tortillas are probably more popular, and some may say more authentic. However, I grew up with Sonoran-style food here in Phoenix, and flour tortillas are commonly used for enchiladas. My family also prefers flour tortillas, but you can use whichever kind of tortilla you like best. Instant Pot Creamy Chicken Enchiladas are made with shredded salsa verde chicken, cheese and cream cheese. 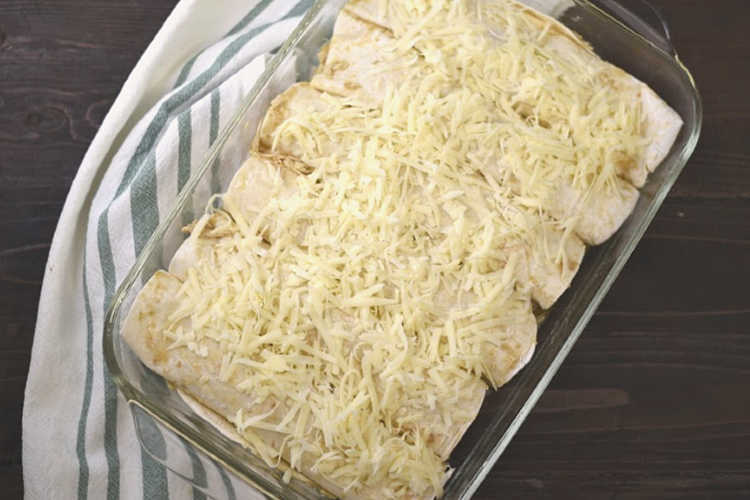 An easy chicken enchilada recipe the family will love! Open pot, and remove chicken to a large bowl. Pour the cooking liquid into another bowl. Use a hand mixer to shred the chicken slightly. You want the chicken cut into small chunks instead of finely shredded. Or shred with 2 forks. 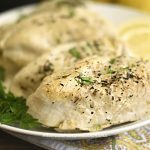 Recipe was made using 6-quart Instant Pot pressure cooker, but an 8 quart can be used without changing amounts or cooking time. Makes enough for 12 enchiladas -- divide cooking liquid between 2 pans, but you can make 6 at a time and refrigerate or freeze the rest for later or use chicken for another recipe. Use as much cheese as you want and additional salsa verde if you prefer. I hope you enjoy these easy Instant Pot creamy chicken enchiladas as much as we do! 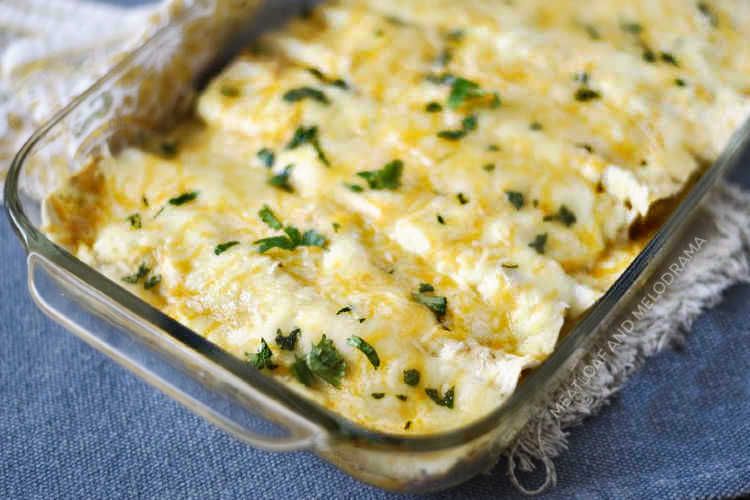 Enchiladas are a favorite in our house, so I know I’ll be making this. Thanks for the recipe! I made this as a family dinner and all my kids loved it. Definitely a hit. Chicken enchiladas are a favorite around here! I should make them asap! I have everything for this! Got to make it tonight! Another winner!! Easy and oh so good!! I must have bought tortillas that were to large, because I only made 6. But, since there’s only two of us that’s dinner and a few lunches. Loved these!! !